Health THE NUMBER OF BRACELET LINES ON YOUR WRIST CAN TELL A LOT ABOUT YOUR HEALTH. HOW MANY HAVE YOU GOT? The first wrist line is in fact the most important wrist line. When this line is distinct and deep, it indicates good overall health. In general, people with such lines are physically fit. If, on the other hand, the first line is indistinct or scantily marked, it indicates some health problem.In women, when the first line bends upwards toward the base of the palm or when it’s broken, it indicates gynecological problems such as difficulty conceiving, irregular or absent periods etc. 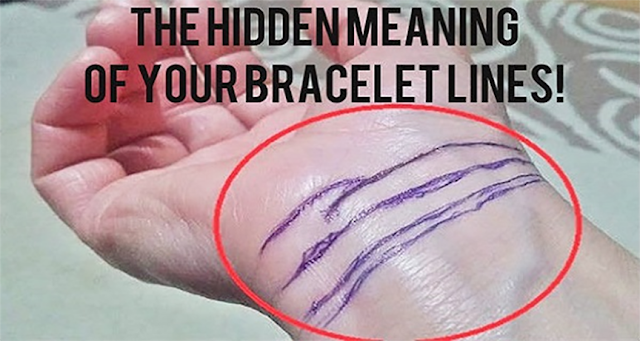 In men, when the first line bends upwards toward the base of the palm or when it’s broken, it indicates prostate, urinary or reproductive problems.The second wrist line is linked to a person’s wealth, prosperity and happiness. Ideally, this line should be unbroken.